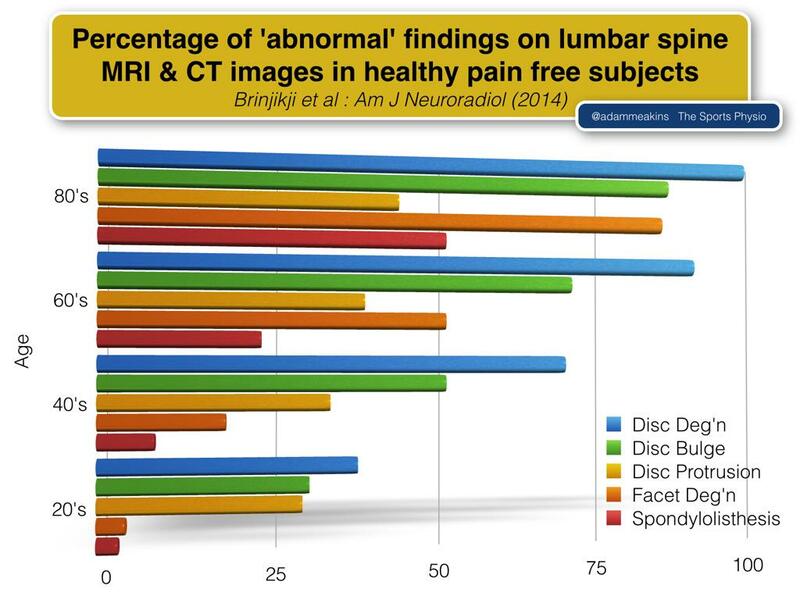 We also know that the majority of MRI scans are misleading at best – see image by Adam Meakins @AdamMeakins – which shows that 50% of people in their 40’s will have a level of disc bulge, and be pain free. So we can see that the words used can greatly alter the persons perception of their symptoms. We can talk ourselves into being in pain. So what can we do to make a positive change? The fundamental message from any clinic should be about movement. Movement is good. No, Movement is key. And at a time when hardly a week goes by without an Obese Britain type headline, we can all do our bit to get people moving. Instead of telling the world how “hard” we work at the gym, how much that session “hurt“, how our legs just got absolutely “destroyed“, how about we tell them how much “fun” we have, how much we “enjoyed” that session, how much “better” we feel after each session of physical activity? Instead of telling the world “weights make you bulky“, or “running hurts your knees” (both incorrect, by the way), and arguing over which is ‘best’, why not simply congratulate others for being proactive, and accept that some people enjoy lifting weights, and some people enjoy running. This may seem a tiny, insignificant change. It’s not. It may get someone active. It may get someone out of pain. If we can change peoples perception of gyms, or boot camps, or running, or whatever it is that some people may find intimidating, then maybe we can make a difference to people who struggle to be active. It’s probably worth a try? This entry was posted in Uncategorized on 23rd June 2015 by DCInjuryClinic.